LOVE this idea! 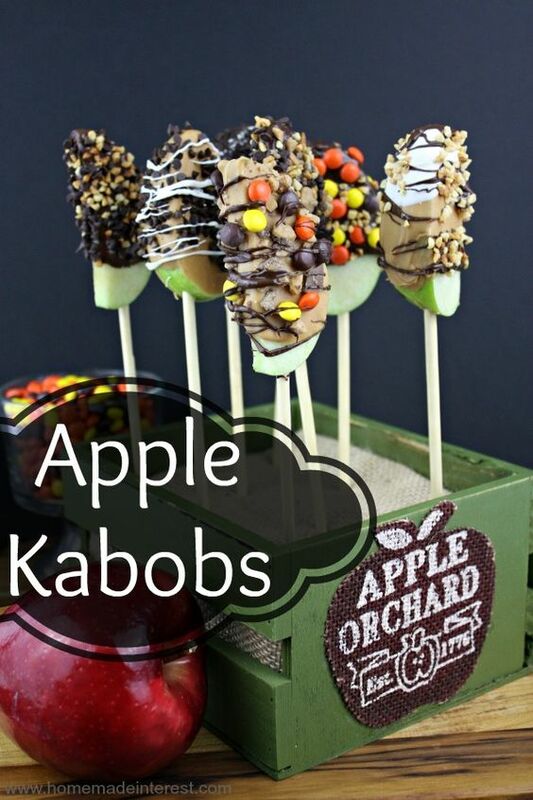 I’m not a huge fan of caramel apples on a stick (not enough caramel to apple ratio! ), but I love the idea of slicing them first, then coating them in caramel and/or chocolate! For the dipping chocolate we simply melted different chocolate melts in the microwave and then dipped the apple slices (already on the skewer) into it. We even created layers of chocolate and peanut butter flavored melts by dipping it once, letting that layer harden then dipping it a second time. While the top layer of chocolate is still melted roll the apple slice in your toppings, or sprinkle them over the apple if you prefer. We used mini Reese’s Pieces, crumbled Heath Bar, crumbled Oreo, chopped nuts and mini chocolate chips as our toppings, but you can you whatever your favorite candy is.